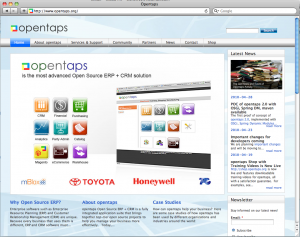 opentaps 1.4 was officially released in March 2010. This release features many new features in CRM, manufacturing, supply chain management, and financial accounting; improved user interface thanks to the Google Web Toolkit; hibernate keyword search; VOIP integration with Asterisk; improved Web security; the opentaps Domain Driven Architecture with Spring framework and hibernate; and upgraded versions of the Apache Tomcat and OFBiz. For more details, see our press release. We’re also very excited about the new opentaps.org, implemented with Drupal by IntegratingWeb. The new site has made it much easier for us to connect with our community, especially with the new opentaps Forum. We’ve also launched the opentaps Shop, a Magento online store for opentaps training videos and related materials. This site will be our platform for offering opentaps-related products by all the partners and developers of opentaps. We have also released an integration between opentaps and the Magento e-commerce platform. This integration will allow you to download products and orders from a Magento store to opentaps, so you can use the CRM, supply-chain and warehouse management, and ERP features of opentaps with your Magento store. Take a look at the opentaps-Magento integration video on YouTube to see how this works. To get started using it, see opentaps-Magento integration on the opentaps documentation wiki. Our main goal for opentaps 1.5 is to make it easier: easier for users to get up and running and easier for developers to start extending opentaps. We will be streamlining the process for setting up your organization in opentaps and importing your data. We are also going to make it easier for you to create new functionality for opentaps in self-contained modules. For more details, see the recent posting on the opentaps forum about these significant changes. OSGi is emerging as the industry standard for building large-scale modular applications. We believe it fits nicely with our long-term goals for opentaps, so we’ve built an initial proof of concept for opentaps 2.0 using OSGi, Spring Dynamic Modules, hibernate, and Apache maven. You can download this proof of concept from SourceForge and follow the directions on opentaps 2.0 Planning to try it yourself. Please help us welcome Amicon Technologies and IntegratingWeb as the newest opentaps Partners. Both companies have a long history of working with opentaps, OFBiz, and other open source technologies, and we are very pleased to have them join us in making open source ERP and CRM a success. I’ve met a number of opentaps developers and users from China, and they’ve all felt that there is great potential for an open source ERP and CRM in China. If you would like to help promote open source ERP and CRM in China, please join us on the opentaps Chinese forum.